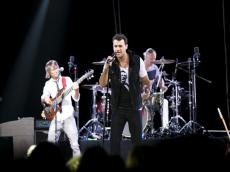 World-famous singer, People's Artist of Azerbaijan Emin Agalarov will perform in the U.S. Pop singer announced a concert tour that will go over the U.S cities, Trend Life reported. People's Artist of Azerbaijan will perform in New York on January 26. The concert in Miami is scheduled for January 30. World-famous singer will please his fans in Los Angeles on February 2. Also, the musician will perform in Canada. The concert will be held on January 29 in Toronto. Earlier, Emin Agalarov announced his collaboration with German DJ and musician, Robin Schulz. "The big world premiere is scheduled for the first day of my concert in New York - January 26," said Emin. Pop singer is going to start the American concert tour with the release of new album and single. Born in Baku, incredibly talented musician moved with his family to Russia at the age of four. After graduating from high school in New Jersey, Emin enrolled in Marymount Manhattan College (New York.) He graduated at the top of his class, delivering a thesis on “Business Management in the Field of Finance". Agalarov's interest in music began in the high school years in the United States. After graduating from high school, he returned to Russia, where he continued composing songs. In 2005 he began working with his vocal and music teacher, the renowned Azerbaijani singer Muslim Magomayev, to whom he pays tribute in his concerts. His first studio album, Still, was released in 2006, selling in the first six months 70,000 copies in Russia, and an additional 30,000 in CIS countries. Emin's media appearances include BBC Breakfast, Extra, ITV's Daybreak, Fox, Entertainment Tonight, Pro 7, The Today Show, E!, among others. He's been featured in The Sunday Times, The Sun, Bilt, Wall Street Journal, The Independent, GQ, Esquire, OK!, among others. In 2016, Emin was awarded as the Most Stylish Musician of the Year. Over the past couple of years, EMIN performed at large musical contests, including the Eurovision 2012, "Miss Universe 2013, the 2014 World Music Awards, and also on the Olympic Games in Sochi on the same year. He is also one of the organizer of summer music festival "Zhara" which has turned into annual gathering of celebrities. Moreover, Emin Agalarov was awarded with the title of People's Artist Azerbaijan and honorary badge on July 31.